There are a few films that don’t really need to be dissected to establish what was wrong with them. In fact the number of things wrong makes for such a long list that a simple sitting of the film establishes this quite clearly. Mohenjo Daro is that film. It’s a film that many will be willing to bet the makers never sat through themselves, because had that been the case, the film would have never been released from captivity to unleash terror onto unassuming audiences (or so you hope). Within a minute of the film beginning with a man vs alligator duel you realise that you should safely exit the cinema hall before it gets worse, but of course, you’ve paid the ticket price by then so you give it a chance. And before you know it you are sitting there trying to sink lower than possible in your seat so as to hide the piercing second-hand embarrassment you feel for the makers. Gowariker pens a film that revolves around a man-child who Hrithik Roshan is all too mature-looking to play. Soaking in self-tanner creams and body oils the man-child makes his way from his modest little village to the city of Mohenjo Daro. There he is besotted by the one-expression-wearing priest’s daughter. In an attempt to save her from a forced marriage he discovers the atrocities of the kingdom that he must put an end to. In the midst of all this he also uncovers the mystery behind the unicorn riddled dreams that he’s plagued with. The above synopsis is not half as ridiculous sounding as the film actually is! Ashutosh Gowariker’s takes the audiences to be buffoons who will fall for cartoony VFX and warped interpretation of history all mixed with some classic ingredients from his previous outings. Hrithik Roshan with all the self-tanner and face quivering acting in the world couldn’t save this one! Instead he ends up hamming most of the scenes making them un-intentionally laughable. Pooja Hegde is simply annoying as she delivers every line in the same tone and every scene with the same expression. Arunoday Singh and Kabir Bedi are the better part of the film but even then it is hard to take them seriously amidst outrageous costumes and situations. Your only saviour in the cinema hall is Rahman’s soundtrack which you hold onto with your dear life hoping it will make it all better… if only. Not only is every situation, twist and turn more laughable than the last in Mohenjo Daro, the screenplay drags each portion on excruciatingly, making you want to burst into tears when the words ‘intermission’ appears on the screen as you were so ready by then for the credits to roll. 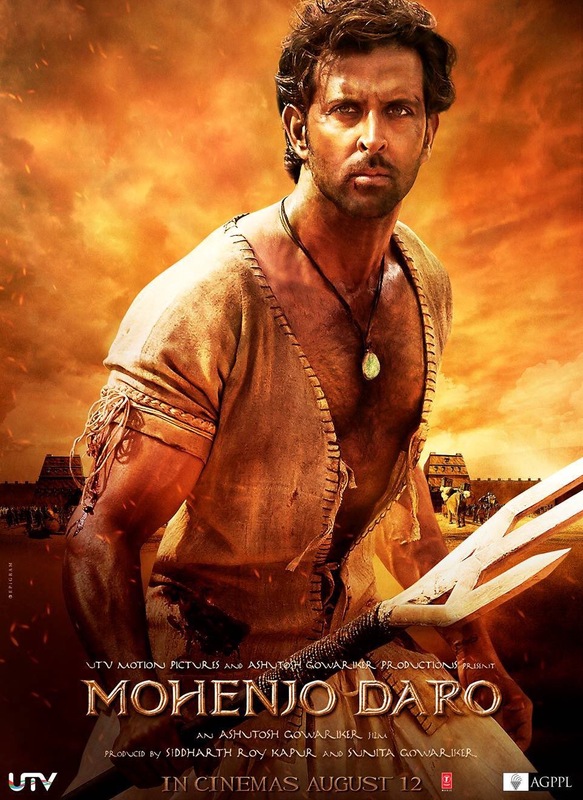 Mohenjo Daro is a film that should come with a warning sign. Not for the faint hearted. Maintain your sanity by steering clear of this cinematic tragedy.